You are currently browsing the tag archive for the ‘George McManus’ tag. 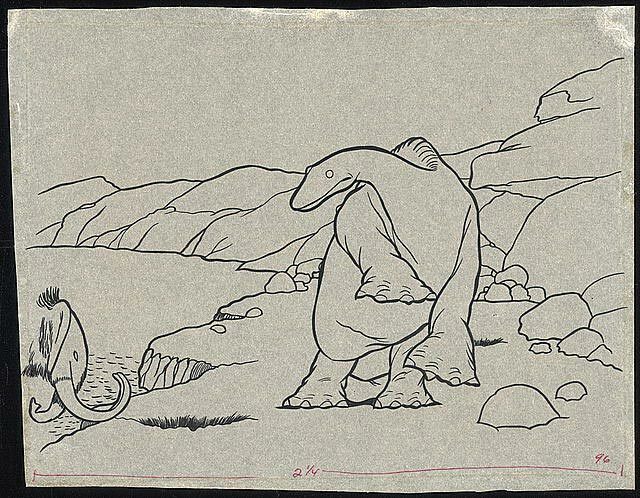 ‘Gertie the Dinosaur’ was Winsor McCay’s third animation film, and it certainly is his most famous one, still capable of entertaining new audiences. The film follows a same story idea similar to that of ‘Little Nemo‘: during a visit to a natural history museum Winsor McCay bets the famous comic strip artist George McManus that he can make a dinosaur move. After these long nine minutes of slow live action introduction, we finally see McCay’s creation: Gertie the dinosaur. McCay’s dinosaur appears to be a girl dinosaur. She behaves like a trained animal: she listens to what McCay is telling her, she eats a rock and a whole tree, she bows to the camera, she lifts her feet, she’s being startled by a small mammoth, which she throws into the lake, she dances, and she lifts McCay himself on to her back. The captions in between replace dialogue, which was part of a vaudeville act with Winsor McCay talking to Gertie and she listening to him. This vaudeville show, with which McCay toured, has been recreated in the Disneyland special ‘The Story of Animated Drawing‘, which aired on November 30, 1955, and which is available on the DVD set ‘Behind the Scenes at the Walt Disney Studio’. At the 2014 Annie Awards Ceremony Bill Farmer also reenacted McCay’s vaudeville performance (included below). The reenactment makes the experience of the original film much more vivid, and watching this version is highly recommended. The short is impressive because of its fine animation, command of perspective and detailed background art (which had to be drawn over and over again), but what really makes the film a milestone of animation is that Gertie the Dinosaur is the first animated cartoon character with personality. She’s not just any dinosaur, she’s a female dinosaur, behaving half like a trained animal, half like a small spoiled child. She cries when being scolded by McCay, and is clearly happy when performing her little dance. Watching the interaction between her and (the off-screen) McCay is impressive, but it’s also delightful and fun. ‘Gertie the Dinosaur’ had a huge impact at the time, and inspired a whole generation of animation film pioneers (e.g. Paul Terry, Frank Moser, Pat Sullivan, Otto Messmer and the Fleischer Brothers). The film truly is an all time classic, and enjoyable to this very day. ‘Gertie the Dinosaur’ was followed by the unfinished and much less successful film ‘Gertie on Tour‘, of which McCay completed only two scenes.